Chuckles Comedy Club has been around for years, hosting professional comics from around the world. Often using local comedians as hosts or openers, Saint John Comedy fans can always count on belly laughs from start to finish. Never in the history of Chuckles, have they offered a headlining spot to a local comedian … until now. Mark Splude came onto the scene like the ball of fire he is, wowing stages from corporate events to rooms filled with soldiers to your Uncle’s 40th birthday party. Mark can also be heard on the Joe Leary Experience every Thursday at 4:40 pm on the “Gotta Minute” segment – cracking up radio listeners around the world! Mark has opened for many international comedy sensations like Kathleen McGee, Casey Corbin, Mike Dambra, Jason Rouse and Darren Frost. He also hosts a weekly podcast called The Spludecast, that can be heard on Soundcloud and iTunes. 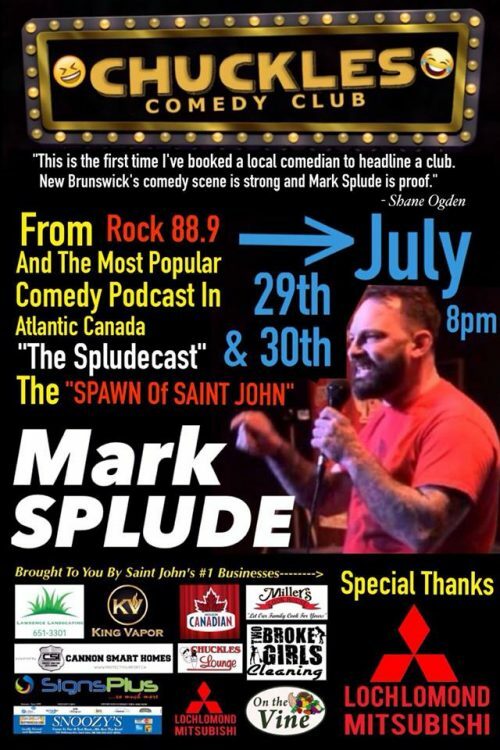 Head to Chuckles Comedy Club this Friday July 29th or Saturday July 30th at 8 pm for a side-splittin’, knee slappin’ great time with the first ever local headliner to reach the top of the Chuckles comedy ladder, Mark Splude! Call 608-3677 for ticket delivery, or stop into Chuckles in the Parkway Mall. They are going to sell out for a reason, so don’t miss this show!